When I go to professional development (PD) it is really important to promote the “What’s in it for me” factor with me – if this does not happen it is really hard to get me to want to engage with what ever it is I am being shown. Flickr is a classic example of this – while many of my friends are into using Flickr as a photosharing service and it had been demonstrated in a PD session – it was never a service that engaged me. Unlike the younger generation (lets just say that I have been 21 for years) I have no desire to share all my family and holidays online (that is why I have great photo albums). Nor do I want to store my photos on Flickr and then link to my other websites (e.g. Mobile Technology in TAFE wiki) – really what is the point – just my work for me – when the sites have sufficient storage room for my photos. This has all changed – lately I have been taking a lot of photos from conferences and PD workshops and others have been asking me to send them copies. After coming back from the Pilbara I have been sitting pondering how I was going to get the photos to Karen Higgins at Pilbara TAFE when reading a post on Mosaic Maker by Robyn Jay from NSW Learnscope gave me the answer that was sitting on my computer all the time – Flickr . So last night I finally got properly into using my Flickr account. 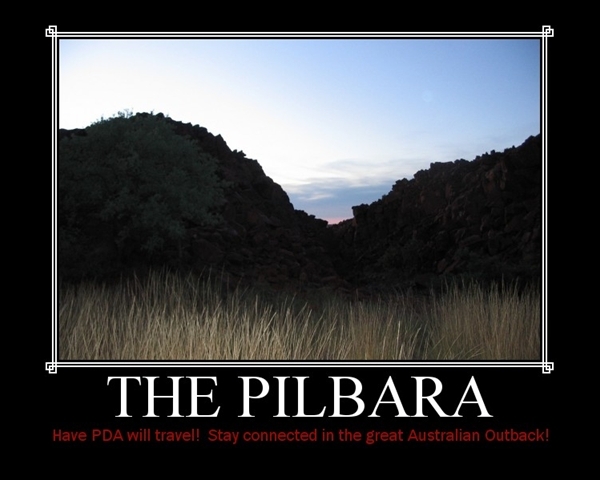 I uploaded all my photos from the Pilbara into my account and then sorted them into sets. Now Karen can quickly work through the photos and select the ones she wants to use. Also I now plan to upload more from other events so others can choose the ones they want. Finally for a bit of fun I checked out the great fd’s flickr toys that Robyn talked about in her post on Mosaic Maker. I decided to give the Motivator a go – which you can use to create a motivational poster from your Flickr photos – fantastic fun and yes I know I am definitely not very creative. Thanks yet again, Robyn, for all the mentoring you give me (and when often you do not realise it.